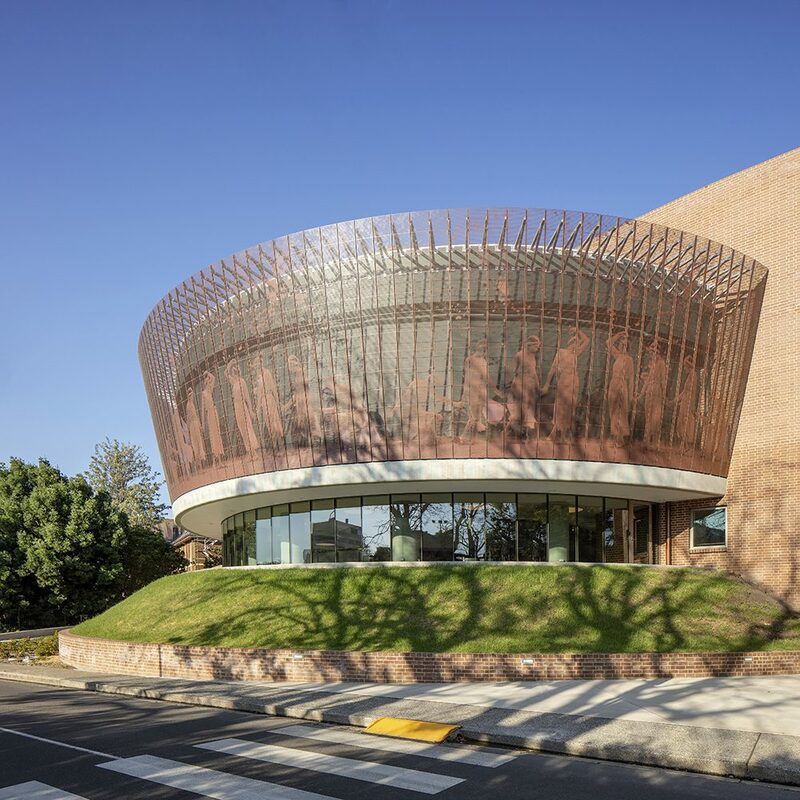 The Sibyl Centre at Sydney University’s Women’s College captures both history and the sense of looking forward in its unique curved copper facade. 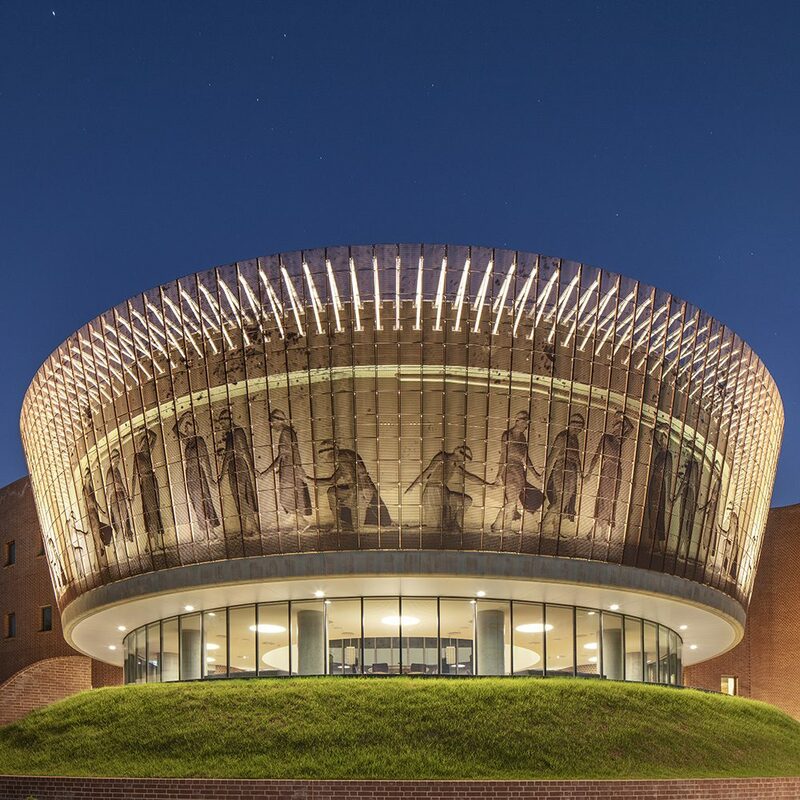 The facade, designed by m3architecture, depicts the historical Greek figure of Sibyl – known for her great wisdom and prophecies. The character is also drawn from the play A Mask, which was performed at the college in 1913 to celebrate women’s education. A century later, Sibyl has again been used by the College to represent female wisdom and foresight and celebrate women in education. 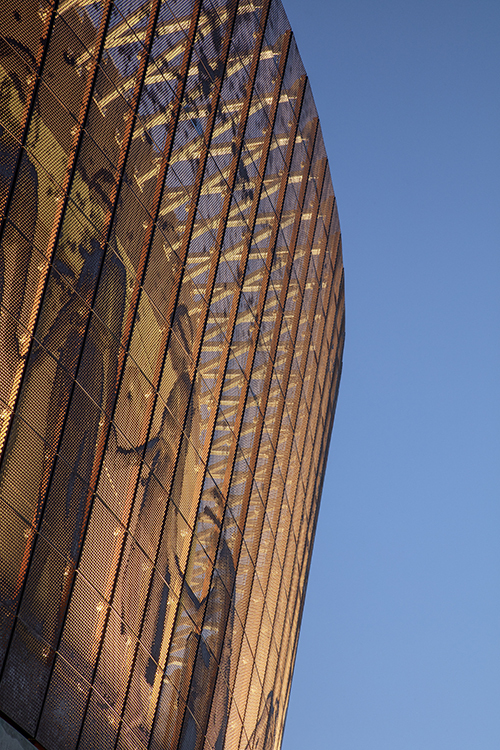 Perforated copper panels by PerfTech have been configured to depict the image, supported by Tensile’s 6mm stainless steel cables in a custom-clamp arrangement. 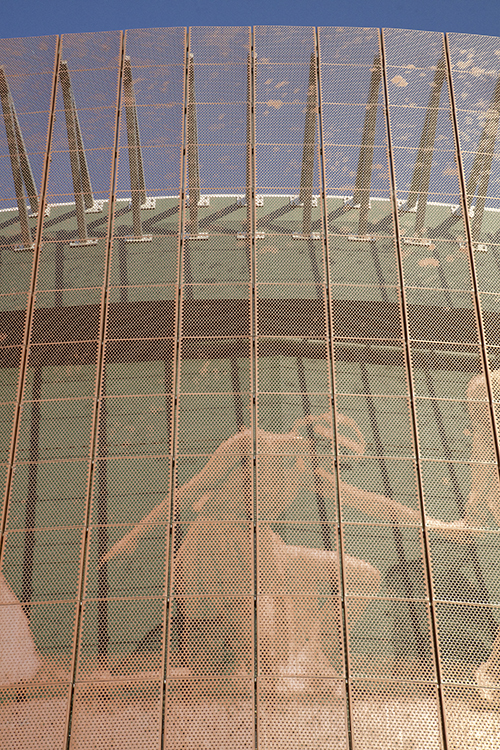 Our brief was to give the facade a seemingly frameless and floating appearance. 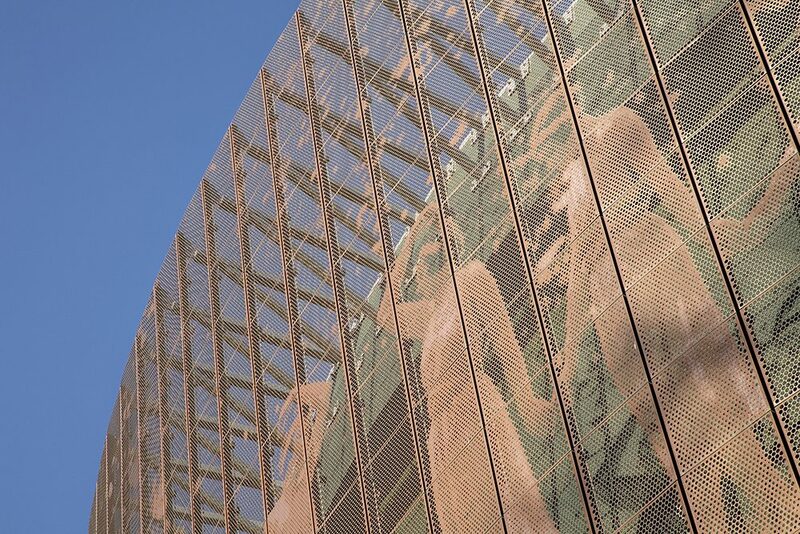 We managed this by ensuring the 6mm stainless steel cables are as invisible as possible, in turn facilitating the transparency and clarity of the perforated panel image. This was a job that required a great deal of fine precision. We used 3D computer modelling prior to installation to ensure the correct geometric curve and perfect fitting of the panels. We worked with a tolerance of only 2mm in the project to achieve our goal and meet the client’s brief. 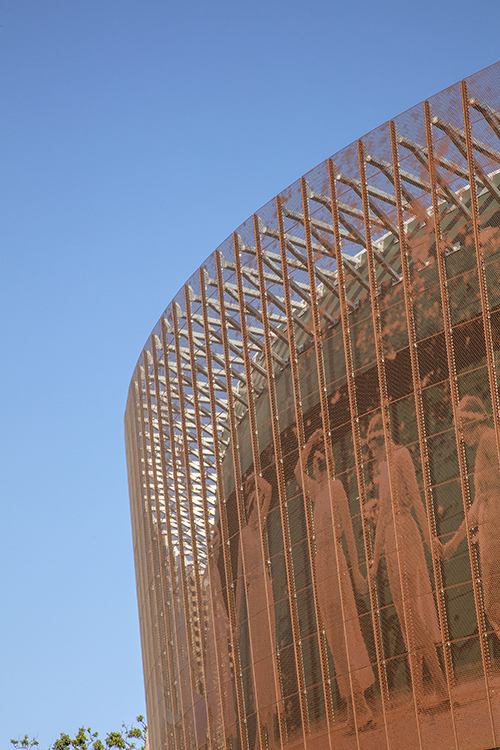 To save time and ensure efficiency, the 1,248 copper panels were packed in the same order they would be installed in – creating a smoother transition from planning to construction. The university’s Women’s College was founded in the 1880s and has always promoted education and equality for women. 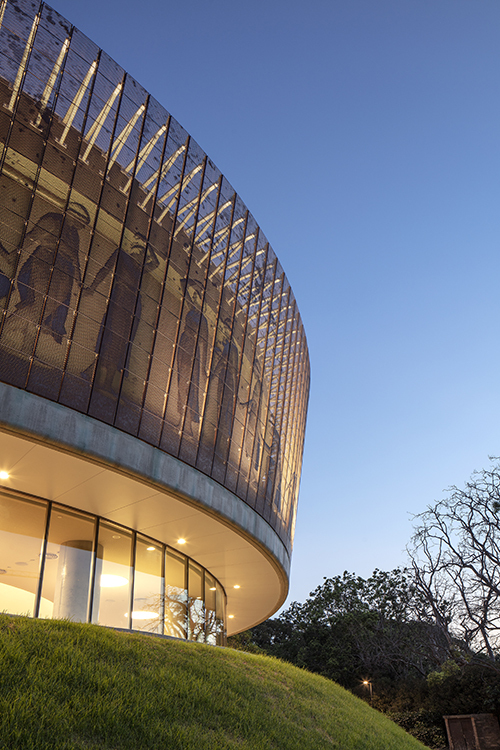 The College’s completed Sibyl Centre comprises spaces for study, music, art and socialising. It also represents part of the Langley Precinct project at the university. As well as the Sibyl Centre the Langley project includes renovation of the Langley residential building, three new gardens, carpark facilities and a new staff residence. Tensile greatly appreciated the opportunity to be a part of this truly unique project that celebrates women’s education, and enhances the university’s reputation for excellence.